Have you ever sat next to a crying baby on an airplane? Remember the 2-year-old throwing a fit in the grocery store and wailing? Do barking dogs in the middle of the night irritate you? Noise impacts us both emotionally and physically every day. Evaluating the level of noise in your nail salon and taking steps to reduce it benefits you, your staff, and your guests. Online review sites for nail salons often reveal that one reason for a poor review is excessive noise. Those one- or two-star reviews are important, as they may be turning away potential business. Are you risking a poor online reputation by not considering how your noise level can impact the client experience? While some degree of noise is a reality for any nail salon, you can take proactive steps to eliminate or reduce unnecessary noise. While there may be some people who enjoy the party atmosphere of a noisy nail salon, many enjoy a quieter experience. Guests come to the salon for many purposes. First, they need or want your services — but they may also be seeking an escape from a busy work schedule or other demands. Consider all the reasons your guests come to you. A colleague of mine shared that her personal escape while her husband was undergoing cancer treatment was to drop him off at the clinic and then go get a pedicure. She needed that hour of respite, and the “me time” helped her to cope with a situation that was stressful. When exposed to constant noise over time we can become acclimated to it. You can become so used to it that you don’t even notice just how loud it is. 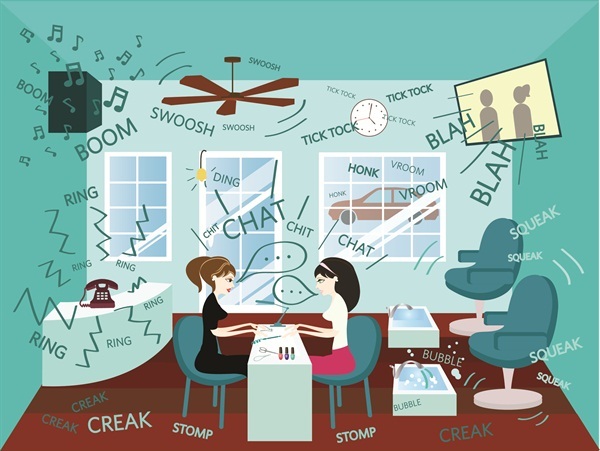 Ask clients and staff if they feel the noise level in your salon is too loud. If you see a trend indicating that noise is a concern then begin taking proactive steps to address the issue. A great place to begin is to take the time to actively listen to the noises in your salon. Pick a time before anyone else arrives. Listen carefully to the background noises. Can you hear ceiling fans, the air conditioning unit, or traffic outside? As clients arrive, take note of how the noise level rises with the addition of more people, pedicure chairs churning away, files zooming, and the television on. How does background music adds to the noise level? The background music that you think is soothing may be contributing to noise overload. Are the employees’ voices louder as they try to talk above ringing phones and the drone of the pedicure units? Make a list of all the sounds you hear and consider if they can be reduced or eliminated. The Karma Day Spa in Tucson, Ariz., takes a lesson from teachers and requests that both guests and employees use their “spa voice” during working hours. Operations director Angelica Contrerras shared their no-exceptions policy on cell phone use. “We do not allow guests to use their cell phones because it disturbs the guests who are trying to relax,” she says. This policy focuses on the comfort of the client. Sue Thirlwall, CEO of MiniLuxe, which offers nail, brow, and waxing services at eight locations in the greater Boston area, feels strongly about noise in the salon. She is proud of the fact that MiniLuxe has never received a noise complaint. The philosophy at MiniLuxe is not just good website copy — it translates to their practices as well. Their “guest first” policy states, “It’s time to press pause — to spend some quality time doing what’s good for your body and your soul. To revel in the moment. To care for yourself.” Says Thirlwall, “We are respectful of our valued guests and create the right atmosphere. Our emphasis on keeping noise to a minimum and our focus on cleanliness all add up to our goal of creating an environment that lets our guests take a moment to breathe, to relax, to care about themselves,” she says. Flexible space planning may allow you to provide the best of both worlds. Younger guests may want the social atmosphere of one big room, while other guests may seek more privacy. A solution that is gaining popularity is to have moveable walls or even curtains between pedicure chairs or nail stations. This not only creates a sense of privacy but the fabric of the curtains can act as a sound barrier. Other options include physically separating the pedicure areas from the nail stations to buffer the noise levels of the chairs. Sam Margulies, spa designer and owner of Atmosphere Spa Design and Consulting in Montreal, Canada, considers noise in all aspects of the salon. “An easy way to cut the noise level and echo is to place a water feature in each space,” he says. “It will act as a ‘white sound’ and ‘swallow’ the sound reverberation.” Not only does this help to reduce noise it makes for a more relaxing environment for both guest and staff. Equipment selection from e-files to pedicure chairs should include an assessment of the amount of noise generated. As more customers move to natural nails or longer-lasting gel-polishes some salons are choosing to eliminate acrylics and electric files altogether. Background noises contribute to noise overload. Do you really need the TV on during all working hours? Consider using the captioning button on the television rather than simply having it turned on loud enough so that all guests are forced to listen whether they want to or not. Most important is to begin to take some action — even small steps help if noise is an issue in your salon. The National Institute for Occupational Safety and Health (NIOSH) with the CDC recently released a study of ventilation systems used in nail salons. (You can view the report at www.nailsmag.com/handouts.) One of key characteristics of those systems was the decibel level of various exhaust ventilation systems. While these systems and units are designed to control hazardous exposures, they may be adding to the level of noise pollution in the nail salon. The study reviewed exhaust systems and nails station units that produced as much as 87 decibels of noise. Those 87 decibels are as loud as a screaming child and louder than an alarm clock. The report recommends that exhaust units be placed as far away from the nail technician as possible to avoid excess noise exposure.